July 17, 2018 | Michele Cohen, Ph.D.
Women have long played roles in Capitol art. In the 19th century, they appeared primarily as allegorical figures in murals and architectural sculpture representing ideals, not individuals. However, as women took on more prominent positions in society and won basic rights (such as the vote, in 1920), their greater opportunities and visibility have led to more U.S. Capitol sculptures and paintings honoring women who have shaped American history. Further, in the 21st century, women are as likely as not to be the artists behind the art. Allegorical figures embody concepts or types of activity (such as love or commerce) and often convey their meaning through the use of symbolic props, or "attributes," that allow the viewer to identify them. Many standard conventions are centuries old, such as the olive branch of Peace or the scales of Justice, but sometimes artists must devise new symbolism to represent new concepts. The Statue of Freedom, atop the Capitol Dome, is arguably the most recognized female figure on Capitol Hill. Sculpted by Thomas Crawford and hoisted into place in 1863, she is both icon and inspiration. Consistent with centuries of depictions of women in western art, her colossal stature and jagged profile give shape to an aspiration, not a specific person. Constantino Brumidi, War detail from the Apotheosis of Washington, 1865. 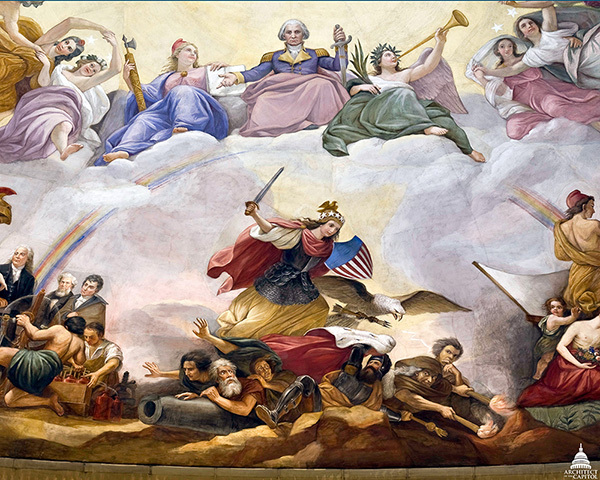 Painter Constantino Brumidi also employed allegorical figures to address big ideas throughout his U.S. Capitol mural cycles. Some, such as War with her sword and shield, are easily recognizable. However, his depictions of the Four Cardinal Virtues (Prudence, Temperance, Strength [or Fortitude] and Justice) in the Senate Reception Room ceiling puzzle many visitors today, illustrating that what was readily understood in the 19th century has become more obscure for 21st century viewers. In Brumidi's scheme, the four Virtues, historically associated with individual leaders, have been transformed into attributes of a governmental body — the Senate. In Charles Fairman's 1913 book Works of Art in the United States Capitol, 15 of 142 artist biographies are of women. Now that number has more than tripled. The first woman artist to create art for the U.S. Capitol was Vinnie Ream, who was only 18 when she signed her contract to produce a statue of Abraham Lincoln, located in the U.S. Capitol Rotunda. Her selection fueled a public relations storm, and critics accused her of using her feminine charms to compensate for her inexperience — although she had, in fact, studied for about three years with sculptor Clark Mills in his U.S. Capitol studio (today the House Chaplain's Office, HB-25), which she eventually occupied as her own studio. 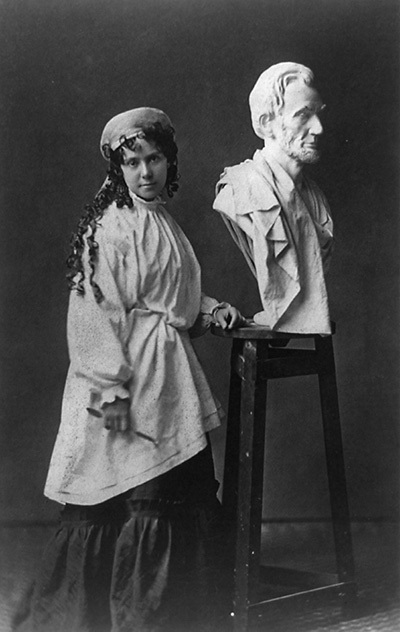 Vinnie Ream at work on her Lincoln bust, which rests upon the stand she used in the White House while President Lincoln posed for her. Since Ream's day, an increasing number of female artists have created painted portraits and bronze and marble statues for the U.S. Capitol, some commissioned by Congress and some donated by states for the National Statuary Hall Collection. Anne Whitney was the first woman to sculpt a statue for the National Statuary Hall Collection. Her marble of Massachusetts’s Samuel Adams was placed in 1876, just 12 years after the collection was created, and it was followed in 1905 by two Texan heroes, Stephen F. Austin and Sam Houston, by Elisabet Ney. As of today, women artists have sculpted 16 of the 100 statues in the National Statuary Hall Collection, and several replacement statues by women artists are in the pipeline. The most recent statue sculpted by a woman to be unveiled is Barry Goldwater by Deborah Copenhaver Fellows, given by Arizona in 2015. Women are also featured in U.S. Capitol art as protagonists in the sweep of American history. 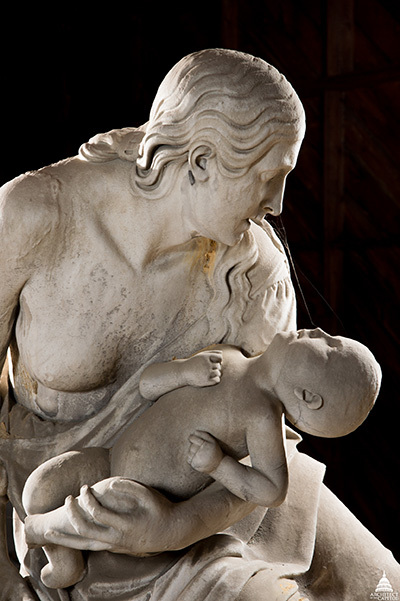 Many are generic types, such as the vanquished Native American mother in Thomas Crawford's Senate pediment or the pioneer mother protecting her infant, a secular Madonna and child, in Horatio Greenough's Rescue, previously displayed on the north cheek block of the East Front and currently in storage. Horatio Greenough, detail, Rescue, 1836–1853. The first woman depicted in the National Statuary Hall Collection was temperance leader and educator Frances E. Willard of Illinois, sculpted by Helen Farnsworth Mears and placed in 1905. Today nine statues in the collection celebrate women. In addition to Willard, they are architect and humanitarian Mother Joseph (Washington); Esther Hobart Morris, a judge and suffragist (Wyoming); Jeannette Rankin, pacifist and first woman elected to the House of Representatives (Montana); Dr. Florence Sabin, scientist and humanitarian; (Colorado), Sakakawea, member of the Lewis and Clark Expedition (North Dakota); Maria Sanford, one of the first female college professors (Minnesota); Sarah Winnemucca, defender of human rights and educator (Nevada); and Helen Keller, disabled rights activist (Alabama). Adelaide Johnson, Portrait Monument to Lucretia Mott, Elizabeth Cady Stanton, and Susan B. Anthony, placed 1921. Separate from the National Statuary Hall Collection, several other prominent U.S. Capitol artworks feature women of historical significance. 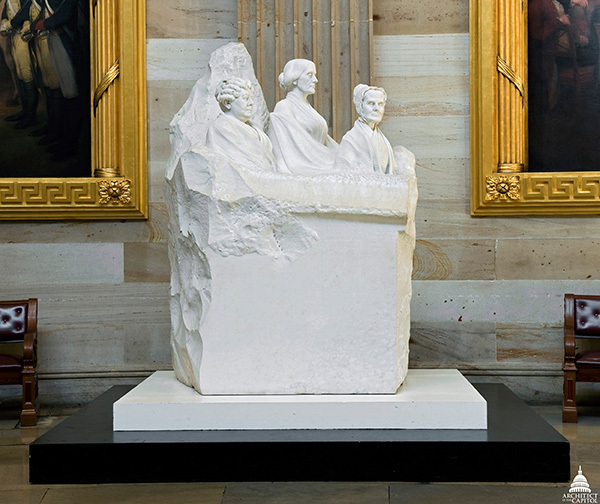 Adelaide Johnson's Portrait Monument to Lucretia Mott, Elizabeth Cady Stanton, and Susan B. Anthony was presented in 1921 by the National Women's Party to mark the ratification of the 19th Amendment. In 2005, Congress passed legislation to commission a statue of civil rights activist Rosa Parks, and Artis Lane's bust of Soujourner Truth was unveiled in Emancipation Hall in 2009. An animated portrait of the first African-American woman to serve in the House of Representatives, Shirley Chisholm, was acquired in 2009. As more women from diverse backgrounds win elected office and gain increasing prominence on our national stage, U.S. Capitol art will continue to reflect the changing nature of women's role in society. Great article. Learned a lot. Thanks for explaining many terms such as allegories, and the role of woman in Capitol Art. I am writing a book about the Statue of Freedom and will go more into depth with Thomas Crawford and the times when the statue was designed and placed on the Dome. A US Capitol Fellowship allowed for in depth time to research in the Curators office and Library of Congress.